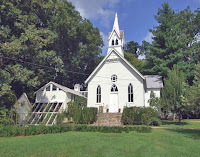 The day dawned cool and bright – perfect for the accelerated marketing event (some know it as an auction) of an historic church property belonging to the gifted artist and my friend, Tatiana. As the temperature slowly climbed and the sun shone through the tall trees surrounding the buildings, people gathered for the 11:00 a.m. event. The auctioneers from Auction Brokers set up a tent and had music playing while people wandered the grounds and explored the church building, modern addition, and kiln building. Then it was time to start. 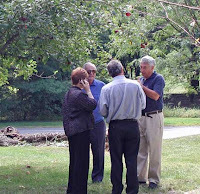 People stood around, some in the sun, some in the shade under the apple and pear trees along the driveway. 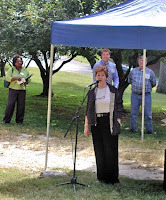 After making the official announcement about the terms of the sale, Paul had me say a few words to the crowd. Really. A few words – he told me to keep it brief. And when I did, he made some crack about never having heard me say so little before. The nerve! Then the auction started in earnest. Paul has a wonderful voice, and his classic auctioneer song rang over the speaker system as his assistants kept in close touch with the group of serious bidders. When it appeared the bidding was just about over, he called a brief recess so we could phone Tatiana in New Mexico for approval of the price. Then one more short bidding opportunity, and it was done. Sold! No, I won't tell you what it sold for yet – settlement is October 20. But I can tell you that Tatiana was satisfied with the price, the new owner knows the neighborhood and has a sense of the history that goes along with his purchase, and I felt the auction was a success. He's wider than he is tall, but he works like a charm. Never complains, just gets down to work vacuuming every floor in the house making sure to get close to the walls as he goes. Needs absolutely no supervision either – he just does his thing and then goes home. 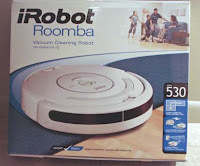 Did I mention that his name is Roomba…and that he is a robotic vacuum? We bought the Roomba to stand in for the lady who cleans for us but has not been well lately. I love this fascinating machine. He's more fun than having a pet around. This little wonder works in a random pattern, and it is hard to leave it alone at first. You want to move it and make sure it gets a certain area. But patience, as always, pays off. It has its own "built-in" pattern of cleaning. It's amazing how much stuff this little guy picks up. We have different floor surfaces in our home including carpets, ceramic tile, and wood. This little robot handles them all with ease. It even takes itself back "home" and parks where it also recharges. I feel like I'm in a Jetsons episode! This is another assistant that I have just added to my team. Now I'm vacuuming the Type E way! What's this got to do with real estate? Think about people you delegate work to. Do you hover over them to make sure they get the job done "right"? I've found that once you delegate you need to let go. You wouldn't give the person work if you didn't think they could handle it, so step back and let them do the job. 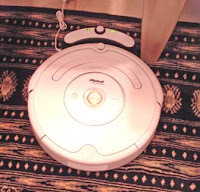 Micromanaging a Roomba is a waste of time – he knows exactly what he's doing, and all you do is slow him down. Works the same with people, don't you think? There was a brand new road sign when I visited a new listing the other day. Frog Mortar Road is one of those funny Baltimore-area names, this one in the Bowleys Quarters area of Baltimore County. There's also a Frog Mortar Creek that feeds into Middle River and then to the Chesapeake Bay. 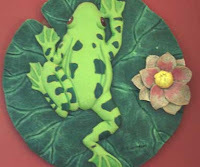 What I didn't know was that my sellers have a love for the hopping amphibians…they are everywhere! As we walked through the 10,000 square foot contemporary home, I kind of felt like I was on a ship – that's how much glass with water views the house offers. And scattered throughout there were frogs. 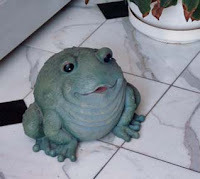 I learned there is even a web site devoted to frogs: http://allaboutfrogs.org/. It reminded me of other collections I've seen in homes over the years, everything from turtles to trains, and hippos to butterflies…and now frogs. 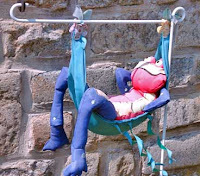 I had to smile each time I saw another example, and each frog in the home has a story. One even lights up at night, and I noticed a great big Christmas frog stored in the carriage house. The owner's favorite is a fat happy fellow who sits in the marble foyer as a greeter, but I have to say mine is the guy in the hammock outside, kicking back and enjoying life. Frogs make me smile. How about you? The evening was a hot one, even for early September in Baltimore. The open house was to start at 6:30, and by 6:00 there was already a crowd gathering outside, fanning themselves, trying to catch the little bit of warm breeze that stirred the trees. To be fair to the owners, we wouldn't open until the official start time. After all, it's not easy getting 6,000 sq.ft. in open house condition, working full time, having a life, and sharing the space with a couple of beautiful greyhounds. The question was – should we turn on the air conditioning, or open all the French doors and let the breezes in? We did both. Before the opening I had time to talk with the crowd of more than 30 prospective buyers and share all the wonderful stuff I know about this historic building and my dear friend, the artist Tatiana. 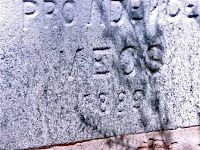 I showed them the cornerstone that reads 1889, and we had time to walk the property and see the freestanding building that housed Tatiana's kiln. What treasures of ceramic art came from that smoke-stained building! The building would make a great workshop, classroom, or storage space. The adjacent cemetery brings different reactions from people. 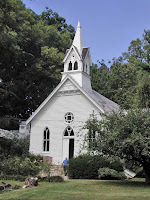 The cemetery was begun when the building was used as a church, and was sold many years ago to the former congregation who still care for it. Some people, often the creative, artists, writers, etc., find the space very calming and peaceful. The extensive decking around the building provides the perfect place to sit and contemplate. There were plenty of questions and it was great to watch the anticipation build as the time grew close to go inside. Not everything about the building is clear from the outside, and the green house windows drew plenty of speculation. Designed by Tatiana's late husband, William Potts who was an architect and used it as his studio, this part of the addition has its own private front entrance as well as a "secret" curved stairway from the inside. I asked the children if they would like to live here, and was answered with such excitement..."Yeah, this would be cool!" So I of course suggested they all go pick out their rooms and then report back to me. 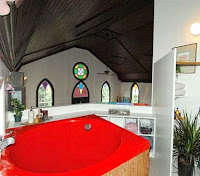 One wanted the studio apartment, one wanted the cool room upstairs with the round stained window, one wanted Tatiana's bedroom and was fascinated by her Japanese RED soaking tub. Remember, I was using my former Pediatric RN training - get the kids involved. 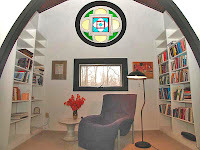 I pointed out the possibility of using the huge library as a master bedroom since it has a full bath attached. The glaze room area with its small office and bath would be an ideal place for a laundry. And that still leaves four bedrooms plus two more baths and a full laundry upstairs. During all this Paul Sobwick, our good-looking auctioneer from Auction Brokers, was listening and talking and making everyone comfortable, answering questions about the auction and how it works. We stayed until almost 9:00 pm, sitting outside and talking about how successful the open house was and what good energy we all felt. We are all very excited about the upcoming auction in just two weeks on September 20. This was definitely not just another open house! Having a historic listing in Dickeyville made me want to visit the Baltimore Summer Antique show that at the Baltimore Convention Center this weekend. The show started on Thursday and ran through Sunday. So after my first showing on 2300 Tucker Lane we took a short drive downtown to the Baltimore Convention Center. Somehow "antiques" makes me think of chairs with delicate legs and fragile porcelain vases. The Baltimore Summer Antiques Show had those, of course, but so much more. 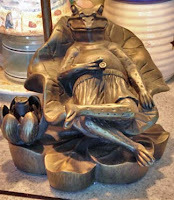 Fine furniture, jewelry, sculpture, and books were only part of the story. 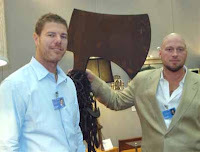 This ax sculpture doesn't seem like an antique, but the two owners of Wells and Company deal in 20th century furniture and art. "Antique" covers a lot! 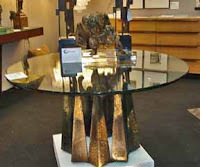 I saw this wonderful Paul Evans table, too – I have a Paul Evans piece in my dining room and I love it. And these hand carved Chinese musicians caught my eye among the Asian antiques from the Chinese Art Gallery. Jean and Harold Ballew own Ballew's Olde Books & Collectibles in Stone Mountain, GA. We were lucky enough to sit and have lunch with this very interesting couple. Jean is also a portrait artist, and Harold also appraises contents of homes. Wish they were in Baltimore - so many time I have an elderly person selling their home and the kids don't want to be bothered with their "stuff" so they then just have it hauled away. What a great service to have someone like Harold to visit the home before this happens. I love this little car – it is a hand made model of a 1930 Bentley Blower by someone who worked at Bentley, and is battery driven. 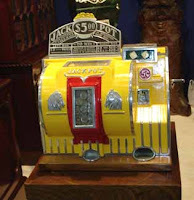 It shared the Daniels Antiques booth with some wonderful old slot machines. Some of them date to the early 20th century like the yellow Jack Pot machine circa 1936. There was more to see at the show than we could take in, but it was a delightful few hours. Even if you're not an "antiques person," you can learn a lot wandering around a good show. A couple of months ago I had a chance to talk about basements. Boring? Nope – finished basements are an opportunity to give a home that extra pizzazz and personality that can help it sell. In fact, that was the point of "Reinventing the Basement," one of the featured articles in the current issue of Maryland Distinctive Properties published by The Daily Record. Journalist Carrie Oleynik found me through my blog on Active Rain. She asked about what kinds of things I have seen in basements over the years. What haven't I seen?! As she says in the article, there have been the usual in-law or au pair suites and personal retreats. 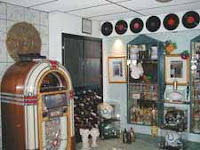 But I've also seen hair salons, wine cellars, specially designed rooms for any kind of collection you can imagine, home-school rooms, and areas just for the convenience and care of pets. Home offices, media rooms, and home gyms are common, but how about an Olympic-sized ping pong table and competition area? 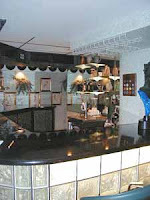 One of my favorites was an amazing basement that had a restaurant-sized C-shaped lighted glass block and granite bar. 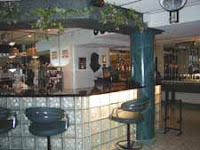 Greek columns visually divided the area that had room for shuffle board, a pool table, big screen TV, gaming table etc. Custom built-ins included wine storage, and the wood burning fireplace added warmth. Behind mirrored doors was a walk-in cedar closet with plenty of storage. Marble floors, a powder room, and separate entrance created the perfect party place. 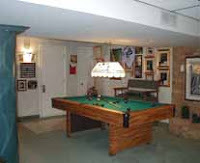 The basement is one area where people can carve out a very personal place and then mold it to their special interests. What's in your basement?